1.Grease 13 x 9-inch or 3-quart glass or ceramic baking dish with butter. 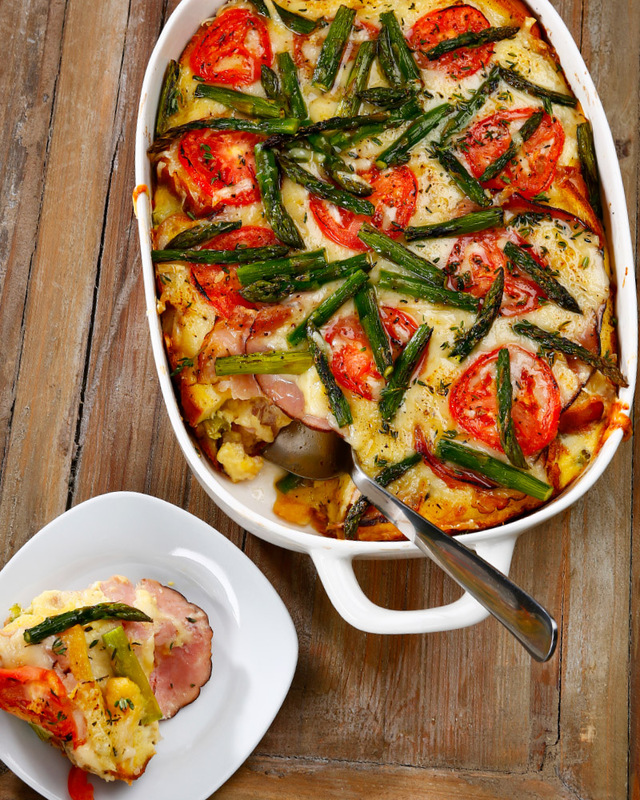 2.In bottom of prepared dish, using half of each, evenly layer bread, tearing to fit if necessary, ham, cheese, tomatoes and asparagus; repeat layers with remaining half of each ingredient. 3.In large bowl, whisk eggs; add cream, thyme, salt and pepper, and whisk until blended. Evenly pour egg mixture over bread mixture; cover and refrigerate at least 4 hours or up to overnight. 4.Preheat oven to 350°. Bake strata, uncovered, 1 hour or until top is golden brown, toothpick inserted in center comes out clean and internal temperature reaches 165°. Let stand 10 minutes; sprinkle with thyme, if desired, to serve. > Opt for the low sodium ham from the Martin’s deli if you are on a heart healthy diet. You can also swap the heavy cream for half and half to reduce down the calories from saturated fat.